We are very much pleased to have the opportunity to introduce ourselves to your esteemed firm. PT. 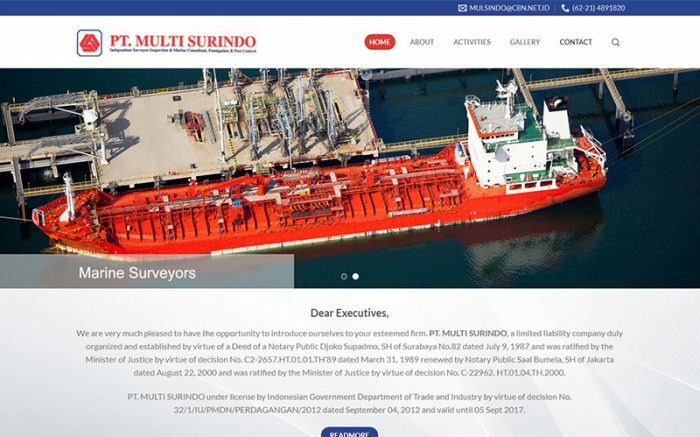 MULTI SURINDO, a limited liability company duly organized and established by virtue of a Deed of a Notary Public Djoko Supadmo, SH of Surabaya No.82 dated July 9, 1987 and was ratified by the Minister of Justice by virtue of decision No. C2-2657.HT.01.01.TH’89 dated March 31, 1989 renewed by Notary Public Saal Bumela, SH of Jakarta dated August 22, 2000 and was ratified by the Minister of Justice by virtue of decision No. C-22962. HT.01.04.TH.2000. © 2017 Solusi Website Bandung. All Right Reserved.